When we released our “Teens, Social Media and Privacy” report in May, one thread of news coverage focused on teens’ “waning enthusiasm” for Facebook. This theme surfaced during our focus group discussions with teens and stood in contrast to the excitement that was associated with newer platforms like Instagram and Twitter. We were not the first to suggest that teens were starting to diversify their social media portfolio, and as such, our report became part of a larger meme that swiftly declared Facebook’s imminent demise. But sampling other items at the social media buffet is not the same as swearing off salad forever. As recent coverage has noted, our national survey data did not indicate a decrease in the total number of Facebook-using teens, even though the focus group findings suggest that teens’ relationship with Facebook is complicated and may be evolving. According to our survey, 94% of teen social media users said they had a Facebook profile, and 81% said that Facebook is the profile they use most often. While other platforms—like Twitter and Instagram—are growing in popularity, teen usage of Facebook still dwarfed every other platform at the time of our survey. One-in-four (26%) teen social media users said they had a profile or account on Twitter and just 7% said that was their main profile. By comparison, 11% had a profile or account on Instagram with 3% saying that profile was the one they use most often. 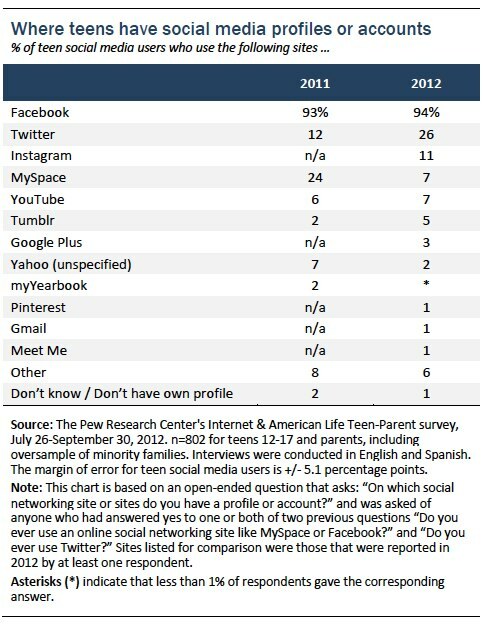 Our research has found teens to be fickle social media users; just six years ago, 85% of teens with profiles said MySpace was their most frequently used account. (Only 7% do today.) But Facebook is arguably a much different animal, and has become more deeply integrated across multiple generations, multiple platforms and devices, and multiple spheres of public and private life. Teen social media users report significant benefits—such as increased social support—from their use of networking tools (not just Facebook). And in the past, the majority of social media-using teens have told us that their peers are mostly kind to one another on the sites. So abandoning one’s online profile can be a complex proposition that requires leaving the good and the bad on the cutting room floor when seeking greener pastures. Instead, the survey data shows that most teen users who are embracing other social media tools still maintain a presence on Facebook. Some may shift their attention away from Facebook by taking a temporary break from the site (as we have noted with adults) or they may simply choose to spread their social media energy across multiple platforms.